President Obama has shattered the budget record for first-year presidents — spending nearly double what his predecessor did when he came into office and far exceeding the first-year tabs for any other U.S. president in history. In fiscal 2009 the federal government spent $3.52 trillion …That fiscal year covered the last three-and-a-half months of George W. Bush’s term and the first eight-and-a-half months of Obama’s. This story was featured on the Drudge Report, so it has received a lot of attention. I’m a big fan of criticizing Obama’s profligacy, but I don’t think it is right to blame him for Bush’s mistakes. At the risk of repeating my earlier post, the 2009 fiscal year began on October 1, 2008, and the vast majority of the spending for that year was the result of Bush Administration policies. 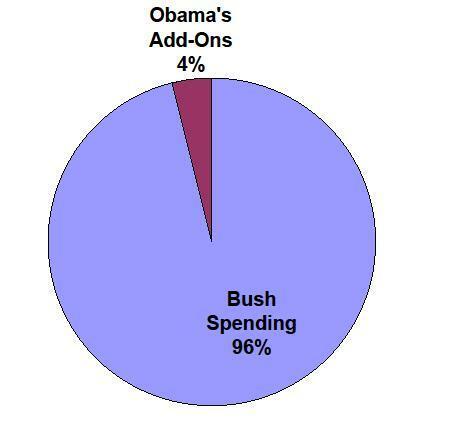 Yes, Obama did add to the waste with the so-called stimulus, the omnibus appropriation, the CHIP bill, and the cash-for-clunkers nonsense, but as the chart illustrates, these boondoggles only amounted to just a tiny percentage of the FY2009 total – about $140 billion out of a $3.5 trillion budget (supplemental defense spending could boost Obama’s share by another $25 billion, but Bush surely would have asked for at least that much extra spending, so individual readers can adjust the number if they wish). In other words, Obama’s FY2009 performance is like a relief pitcher who enters a game in the fourth inning trailing 19-0 and allows another run to score. The extra run is nothing to cheer about, of course, but fans should be far more angry with the starting pitcher. That having been said, Obama since that point has been serving up meatballs to the special interests in Washington, so his earned run average may actually wind up being worse than his predecessor’s. He promised change, but it appears that Obama wants to be Bush on steroids. While perusing the Internet, I saw an article by Iwan Morgan, who is the author of The Age of Deficits: Presidents and unbalanced Budgets from Jimmy Carter to George W. Bush. The author asserted in this article that, “The deficit explosion on his watch was a nasty surprise for Ronald Reagan not a deliberate strategy to reduce government. In his rosy interpretation of Laffer curve theory, the personal tax cuts he promoted in 1981 would deliver higher not lower revenues through their boost to economic growth.” The first sentence is an interesting interpretation, since many leftists believe that Reagan deliberately created deficits to make it more difficult for Democrats in Congress to increase spending. I’m agnostic on that issue, but Morgan definitely errs (or is grossly incomplete) in the second sentence. The Reagan Administration did not employ dynamic scoring when predicting the revenue impact of its tax rate reductions. It is true that the White House failed to predict the drop in revenues, particularly in 1982, but that happened because of both the second stage of the 1980-82 double-dip recession and the unexpected drop in inflation (the Congressional Budget Office also failed to predict both of these events, so Reagan’s forecasters were hardly alone in their mistake). Moreover, Morgain’s dismissal of the Laffer Curve is unwarranted. While several GOP politicians exaggerated the relationship between tax rates, taxable income, and tax revenue, this does not mean it does not exist. 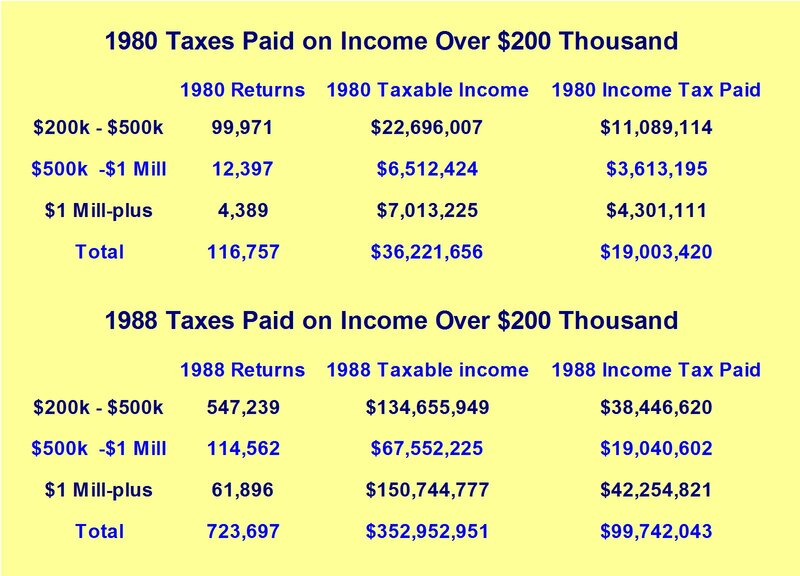 The table below, which is based on data from the IRS’s Statistics of Income, shows what happened to tax collections from upper-income taxpayers between 1980 and 1988. Supply siders can be criticized for many things, especially their apparent disregard for the importance of limiting the size of government, but the IRS figures clearly show that lower tax rates were followed by more rich people, more taxable income, and more tax revenue. For those keeping score at home, that’s a perfect batting average for supply-side economics.